In my introductory post, I promised to take my time in getting to this series. The very fact that this introductory post was made nearly three weeks ago proves that I have already fulfilled this promise to take my time! But I must say that I do not intend to take this long between posts again; instead, I hope to stay closer to a once/week schedule in the future (Lord willing). I have been extremely busy due to several factors: my privileges as a husband, father, and pastor have taken every ounce of energy over the last month. Clearly, weblogging is an ancillary priority for me! But I do hope to maintain a stronger stride, especially with this series on cessationism/continuationism. "Does God accomplish His signs and wonders with the same frequency in every generation?" To affirm His uniquely appointed messengers (Romans 15:18-19, 2 Corinthians 12:12). Much more could be said about the purposes of God’s signs and wonders. For instance, when we say that they serve the purposes of confirming God’s revealed message, along with His messengers, we must subsequently acknowledge that the Lord’s signs and wonders can either serve God’s redemptive purposes (John 4:43-54), or His purposes of judging the wicked (John 12:37-40). 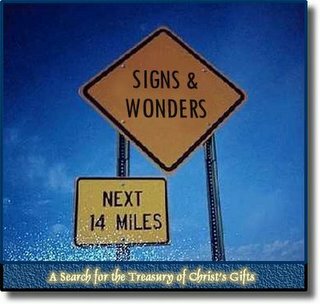 We’ll examine those layers of truth later on, but for now we must take a hard look at the aforementioned four points concerning God’s purposes in His signs and wonders. Frankly, just by examining this list, we should conclude that the discussion is important - without a doubt. After all, to say that the signs and wonders of God point to His glory among men; His special revelation to men; His unique messengers among men; and His glory for all eternity is...extremely significant. Such a first layer of observation helps us to understand that this is not a subject that we should just brush aside in order to avoid controversy. Of course, there will be some who might insist that this is a non-issue and that we should all just “live and let live.” Well, some subjects are worthy of deep study and a thorough defense, and this is certainly one of them. As already stated, when we address the subject of God's signs and wonders, it is necessary to address the matter concerning the Lord's revelatory gifts as well: particularly, do we still have apostles and prophets today? Some will say that there are no apostles, but that there are prophets; some will say that both offices remain with us today, while others will say that both have ceased. Are these important questions for us to answer? Absolutely! In verse 8, Paul supplies us with a brief reference to Psalm 68 which supplies an important and historic picture of Jehovah's conquest over His enemies. By citing this text, Paul helps us to see the Savior's victory, through His death and ascension, such that He (Christ) was endowed with the spoils of His conquest (Psalm 68:18) sufficient to supply the church with what she needs. Thus, by these endowments of Christ, the church is equipped with everything that she needs in order grow, mature and to proceed in the battles of daily life (Ephesians 6:10-18). Thus the gifts that He obtained through His death, burial and resurrection have been bestowed upon the church through the Holy Spirit's work in her midst, and through the Apostles, Prophets, Evangelists and pastors-teachers. Here is an important valuation indeed. When we speak of Christ’s gifts to the church, along with the ...and He gave some as apostles, and some as prophetsaccompanying signs and wonders that were given with Christ's messengers, we understand that we are speaking of the very value of Christ’s own sacrifice which He made on our behalf. What we cannot forget is that His sacrifice not only purchased our salvation in Him, but it also procured the very gifts and riches that have been endowed to His church on this earth - and we are called to spend these riches liberally for the preservation of the unity of the body of Christ: for His glory, and for our Gospel testimony in this world. In view of all this, I contend that this is not a discussion that should be brushed aside as though it were unimportant! There is no greater price tag that could be assigned to this discussion concerning Christ’s gifts to the church - I can assure you! 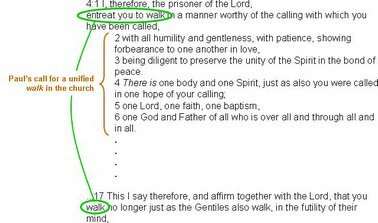 Paul’s evaluation of Christ’s gifts should increase our sense of sobriety when discussing the question of cessationism or continuationism. 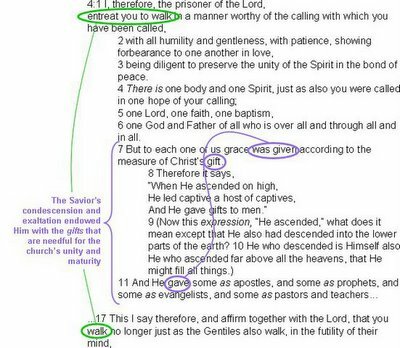 This is why we have begun with a survey of Ephesians chapter 4, for this text answers the question concerning the high value of this discussion about the treasury of Christ’s gifts, as well as the signs and wonders that He has given for the sake of His glory, His message, and His messengers.